The Dutch have always had a love-hate relationship with water. Water gives and water takes the Dutch say in resignation. Water is considered an enemy as it can take lives and cause disaster, but it is seen as a friend because of the fish catch and the recreational possibilities it provides for. The country is intersected by draining canals and these waterways have become essential elements for the economic well being of the whole country. 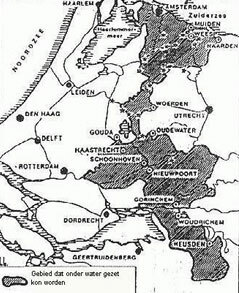 Without water the Netherlands would not exist, may be said, but on the other hand most of the land was won from the sea by poldering. The country is called 'The Netherlands' because much of it lies below sea level, protected against flooding by dikes. The emerging history of the Kingdom of the Netherlands is connected with the brilliant idea to use water as a defensive system against hostile armies during the independence war between 1568 and 1648. At a time that airplanes did not yet exist and horses fulfilled the function of tanks the enemy was hold off by setting large areas of low lying lands under water, as shown in the picture. This made it possible to defend (the present province of) Holland in an efficient and effective manner with relatively few people. But also during the world wars of 1914-1918 and 1940-1945 water played an important roll both in the defence and the freeing of the country. It is impossible to wade swiftly through shallow water. Wading is heavy work and requires a certain prudence to prevent from tumbling due to unseen height differences of the bottom. But frozen water is equally effective due to the slippery surface. Though in early times the enemy could iron their boots and thus walk on the slippery surface they had few chances against the defenders that moved around at great speed on their ice skates. 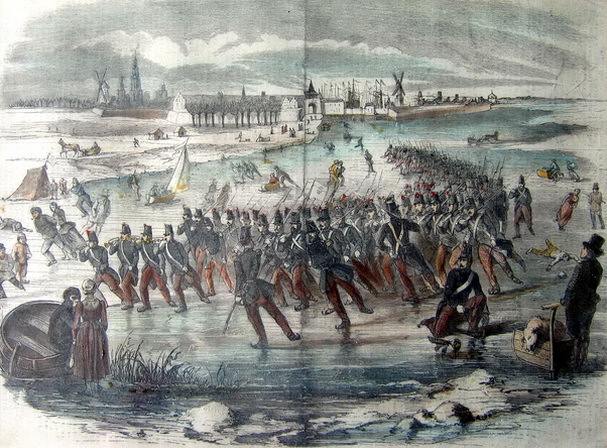 The picture shows that regiments were drilled to move on frozen water, here on the River Merwede before the city of Dordrecht. 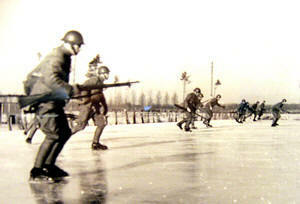 The picture with exercising regiments makes clear that ice skates belonged to the standard equipment of soldiers. It is assumed that military buyers placed orders for them at the local skate makers. Not much is known about this, however. Blauw (Van glis tot klapschaats, 2000) states that the Dutch Ministry of War bought all stocks of Dutch skate makers in the autumn of 1939-1940, when it became clear that The Netherlands could become involved in the World War II, as to provide the army with ice skates. This concerned 'common' skates of course. 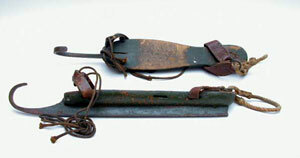 The picture below, however, shows a pair of specially made soldier's ice skates, which is proven by the very heavy execution of them and their colour: army green. Because of their place of finding they probably have been in use with the Belgium army, maybe during the first world war. From the pictures underneath it may be seen that the armies of England and Scandinavian countries have used ice skates as well. 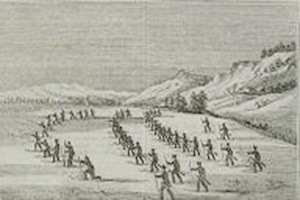 Aside a cutting from a Norwegian paper from 1856 showing a training of the Norwegian armee.